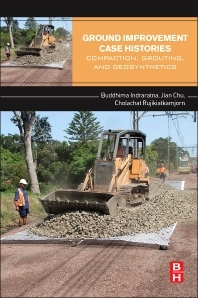 Written by an international group of contributors, Ground Improvement Case Histories: Compaction, Grouting and Geosynthetics provides over 700 pages of international case-histories. Each case-history provides an overview of the specific technology followed by applications, with some cases offering a comprehensive back-analysis through numerical modelling. Specific case-histories include: The Use of Alternative and Improved Construction Materials and Geosynthetics in Pavements, Case Histories of Embankments on Soft Soils and Stabilisation with Geosynthetics, Ground Improvement with Geotextile Reinforcements, Use of Geosynthetics to aid Construction over Soft Soils and Soil Improvement and Foundation Systems with Encased Columns and Reinforced Bearing Layers. Professor Indraratna is the author of more than 500 publications, including 6 books, about 200 journal papers and 50 invited keynote and plenary lectures. His contributions through research and development towards the understanding of soft soil improvement have been incorporated by numerous organizations into their engineering practices for the design of rail and road embankments. Dr. Chu is a professor and the holder of James M. Hoover Chair in Geotechnical Engineering at the Iowa State University, USA. Before he joined Iowa State, he was the Director of the Centre for Infrastructure Systems at Nanyang Technological University, Singapore. He has been actively engaged in teaching, research and consulting work in geotechnical engineering in general and soil properties, in-situ and laboratory testing, soil improvement and land reclamation in particular for more than 20 years. Dr Cholachat Rujikiatkamjorn is an Associate Professor with broad knowledge in soft clay engineering through his work in China, Thailand and Australia. His contributions to the field have also been recognized by several internal UOW, national and international awards, including the 2013 ISSMGE Young Member Award for academic achievements and outstanding contributions to the field of geotechnical engineering. He has published over 120 articles in international journals and conferences.